Get on the long and winding road to achieving profitable trading by working on improving your trading starting today which is a good time for day trading the markets, both U.S. based and international markets. There are good trading opportunities for day-trading commodities, forex & stocks in London, Tokyo, New York, Chicago, Shanghai and other major international cities. For international daytrading all traders should be aware of local and world-wide times. Click-on the time window below for major financial center local times. Although my career started off in various facets of the science (technical, programming, instructor), long ago I became fascinated with the idea of trading in the Futures and Commodities markets. So decades ago in year 1989, I responded to a mail order course to learn about this highly leveraged and high risk/high reward endeavor and jumped right in to commodity futures trading. What really fascinated me about trading the markets was the challenge of market-timing. Putting all other aspects of trading aside in this article, the market timing component attracted me more than anything else and I knew it would not be an easy one to master. There are just too many variables to deal with that it became obvious to me that striving for precision timing would be a life-long work. One can only hope to get real close to exact and hopefully most of the time. 100% precision 100% of the time is just wishful thinking. Over the years I have tried numerous theories and technical indicators in varied combinations and settings. Like many, I've taken suggestions from trading magazines and books only to find very few items worth holding on to. And even what little I held onto from these public sources never produced results I would consider 'precise'. However, all this was not for naught. In time I came to discover market cycles and later to discover for myself an approach to cycle extraction that has proven time and time again to be very precise. However, I must qualify my reference to 'precise' with a disclaimer. It is precise 'a high percentage of the time as opposed to 100% of the time'. And this precision is based on a maximum margin of error of +/- one price bar for the time frame being forecasted. Naturally when such trade precision is claimed possible there will follow the skeptics and critics. And anyone who knows who I am also knows that I have quite a following of such skeptics. Normally this is born out from a lack of understanding on the part of the skeptic and further incensed when this fact is brought out or simply because suggesting that such precision trading is possible can be construed as 'arrogant'. Perhaps. But if it can be done, and I say it can and is, and then I must live with the consequence of making such a statement and its arrogant undertones. Soft-toeing the subject to lessen the accuracy of its statement to avoid the sensitivities of some who wish to deny the possibilities is only veiling truth in favor of ignorance. No advancements are possible until one can learn to accept the possibilities. As stated earlier in this article, there are many variables that one must take into account when it comes to precision. And for anyone to be able to take all the variables into account may someday be possible, but not at this time. However, taking as many variables into account is within reach now and so it becomes important to formulate rules or techniques to take advantage of what we can do and help protect from trading losses due to what we cannot do. And so along with forecasting market turns based on my cycle extraction model, I have a set of guidelines (suggestions) on how to get the most from the output of this model. No, it is not perfect, but it does form a very good foundation to build on. One of the biggest criticisms I hear from some about trading-systems is allowing a +/- one bar deviation or margin of error in my trade results. In other words, if my model on cycles forecasts a market top or bottom for July 27 and it actually occurs with the July 28th price bar, I consider this to be an accurate trader forecast. Some critics will disagree. What has always been the case, however, is that these ones never offer a more precise approach in their arguments. Therefore, as far as what is available today, one bar margin of error is pretty darn precise. When you think that there are enough variables to deal with from within the historical market data itself being calculated on, we must also do all these calculations using the pc-trading-system. Today's systems are extremely powerful and can do a lot of calculations in a very short period of time. When I started with systems back in 1973 at McDonnell Aircraft Co. in Long Beach, CA (as a student of System Programming), they were very large machines in comparison to today and only a few large corporations could afford their hefty price tag. Today, many people have machines many times more powerful sitting on a table somewhere in their home than those I started out on in the 70's. But no matter how powerful they are today, one thing still remains a problem today as it did then, and that is Floating-Point mathematics. Without getting too deep into the inner workings of systems, it has always been somewhat of an issue dealing with floating-points. Modern systems have now what is called a Floating-point processor that decades ago did not exist. The system is made to do some pretty fancy tricks in order to turn ordinary bits (0's and 1's) such as 11010111001 into a fractional representation. And it does a pretty darn good job of it. As both a trader and computer programmer I learned long ago if you have two separate calculations resulting in a floating-point value which should be equal, you cannot do a direct comparison and expect the trading system to respond the two are equal without providing margin for error. Comparing floating-point numbers is dangerous. There are inaccuracies in many such computations, you should never compare two floating-point values to see if they are equal. In a binary floating-point format, different computations that produce the same (mathematical) result may differ in their least significant bits. For example, adding 1.31e0 + 1.69e0 should produce 3.00e0. Likewise, adding 1.50e0 + 1.50e0 should produce 3.00e0. However, when comparing (1.31e0 + 1.69e0) against (1.50e0 + 1.50e0) you might find that these sums are NOT equal to one another. The test for equality succeeds if and only if all bits (or digits) in the two operands are the same. Because it is not necessarily true that two seemingly equivalent floating-point computations will produce exactly equal results, a straight comparison for equality may fail when, algebraically, such a comparison should succeed. If (abs(Value1 - Value2) <= error) then . 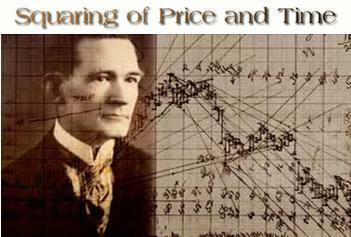 We can teach you how to trade the markets using Gann's best trading methods, including the Geometric Angles Mr. Gann used so extensively, squaring of price & time, using valid gann style "square charts" and gann charting methods, support & resistance numbers and levels, Gann numbers and "w d gann" numerology. Our W. D. Gann Trading Course can teach you Gann's amazing methods for successful trading of commodity futures and stocks. If you closely read and study our unique Gann Course it's quite likely you will learn how to use and implement important Gann trading methods in your trading within 72-hours. This Gann traders course was written by Dave of Webtrading who has studied and used Gann's methods for the past 30-plus years, including studying squaring-price-and-time. He is considered an expert on Gann and Gann's methodology. Trading the financial markets using Gann methodology can work well when trading forex and other futures markets, including the stock market. Here are some (but not all) the key subjects covered in our recommended Gann Techniques Trading Course, which can effectively be used to trade stocks or futures markets using our course based on Gann's unique trading methods. Our Gann trading course contains much of Gann's secrets and techniques to potential successful trading of main-stream commodities, forex currencies and stocks and the stock market, using "hands-on plan English" learning skills. Includes many lessons, charts, plus annotated copies of Mr. Gann's old charts done in his own hand-writing. Our Gann Trading Course also includes a unique custom-made acrylic custom Gann angles tool, with instructions for drawing Gann angles on Gann methodology square price charts. In this Gann Course we address issues such as: Did W. D. Gann use Astrology in his Trading (the answer may surprise you); Square Chart Definition and Usage; Squaring Price and Time; Geometric Angles; Which Gann Angle is most important (answer about why it's so powerful is easy to comprehend); Angle Concepts; Gaps on Charts; What Causes Chart Gaps; The Gann Square of Nine and other powerful Gann trading methods, plus there's more about Squaring Price and Time. Now imagine a trading system designed to analyze years of historical price data where each price is a floating-point value. Various calculations are performed on this data with results further added, subtracted, multiplied and divided by other fractional results. When you consider all that takes place inside the system, to end up with results that are only +/- one price bar off is relatively considered precise! And when you consider that these floating-point values within the system must be given some margin for error if you hope to properly compare the trade results, then logically the final results should be expected to be within a certain tolerance or margin of error as well!